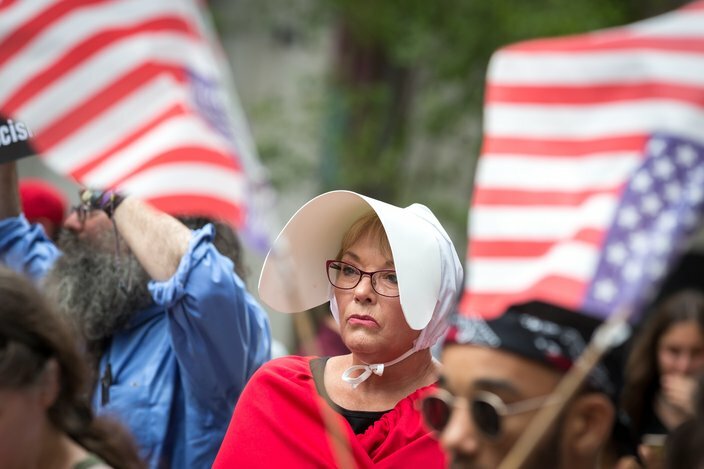 Hundreds of protesters, including a contingent of women dressed in garb from the popular Hulu show 'The Handmaid's Tale,' demonstrate during Vice President Mike Pence's visit to the Union League on South Broad Street in Center City Philadelphia. 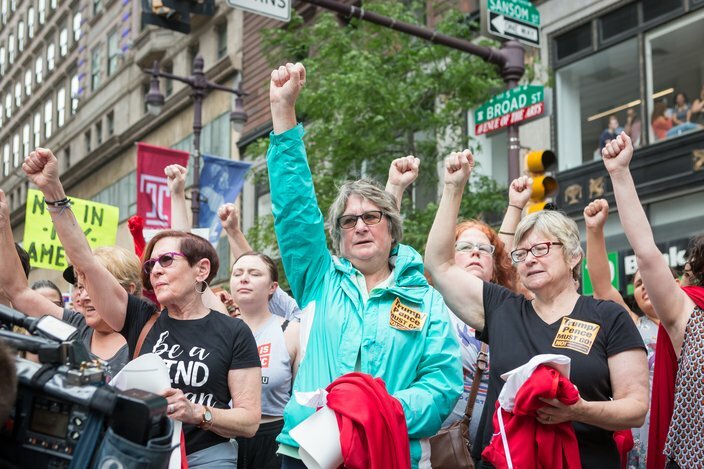 Hundreds of demonstrators took to South Broad Street in Center City Philadelphia on Monday afternoon to protest the visit of Vice President Mike Pence to the Union League. 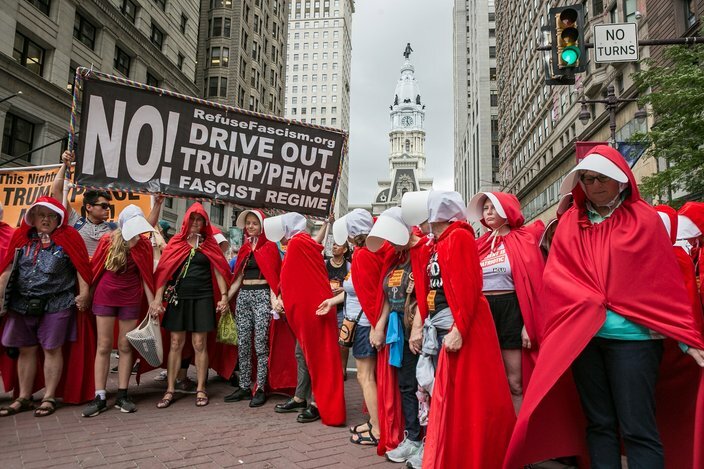 Protesters with at least six Philly-area organizations – Refuse Fascism Philly, the Philadelphia and Delaware County chapters of NOW, Philly UP, the Green Party of Philadelphia and NextGen Pennsylvania – attended the protest. 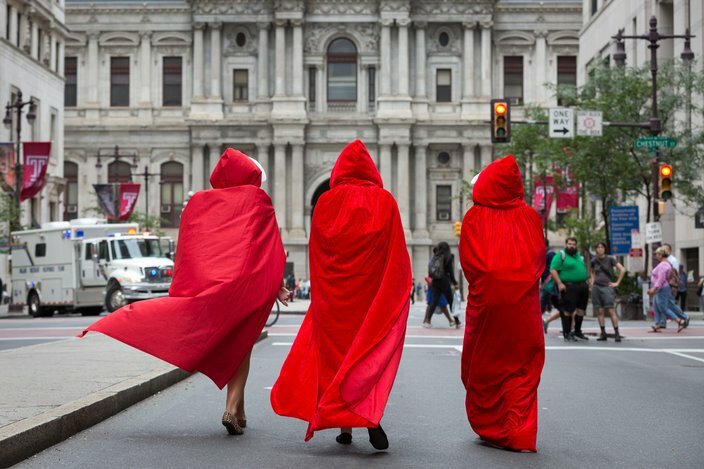 Protesters donned the red capes seen in 'The Handmaid's Tale' as they protested in the middle of South Broad Street on Monday afternoon. 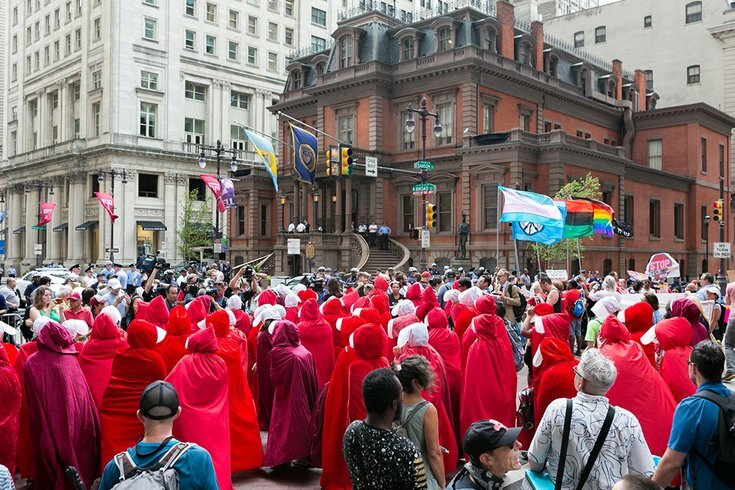 Several activist groups were protesting outside the Union League of Philadelphia, where Vice President Mike Pence made an appearance on behalf of a U.S. Senate candidate. 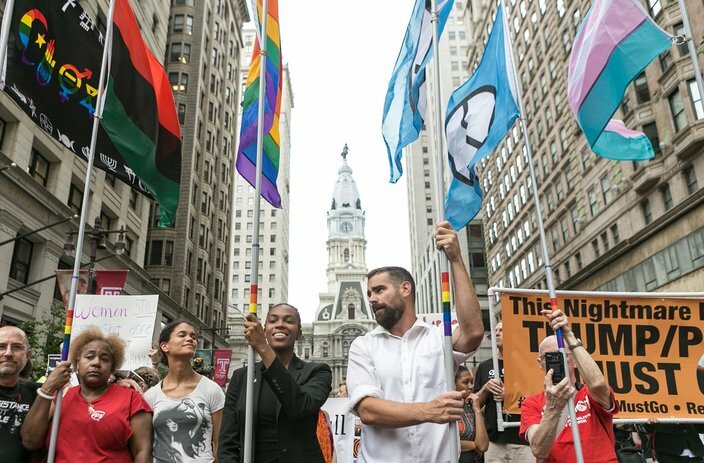 Amber Hikes, executive director of the City of Philadelphia’s Office of LGBT Affairs, holding flag at center left, and state Rep. Brian Sims, holding flag at center right, attended Monday's protest at Broad and Sansom streets. Protesters hold a banner reading 'NO! Drive out Trump-Pence Fascist Regime' during Monday afternoon's protest outside the Union League. Security was tight for Vice President Mike Pence's hour-long visit. Mary Schwab of Bensalem, Bucks County, came to South Broad Street to protest the Trump Administration on Monday, July 23, 2018. 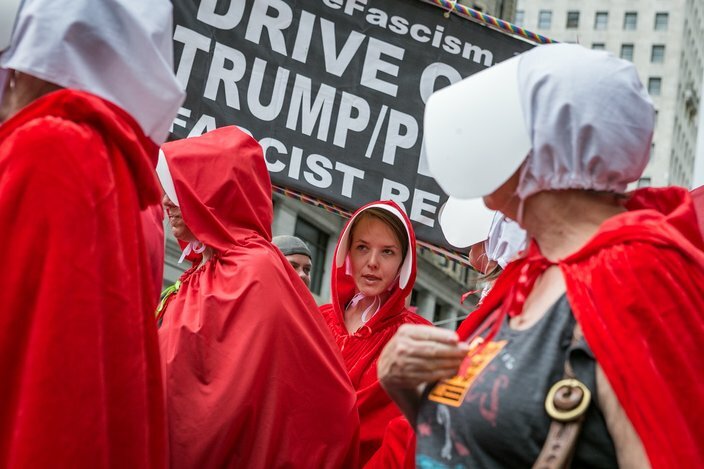 Women hold red capes after taking them off after during the protest over to Vice President Mike Pence's visit to Center City Philadelphia, Monday, July 23, 2018. 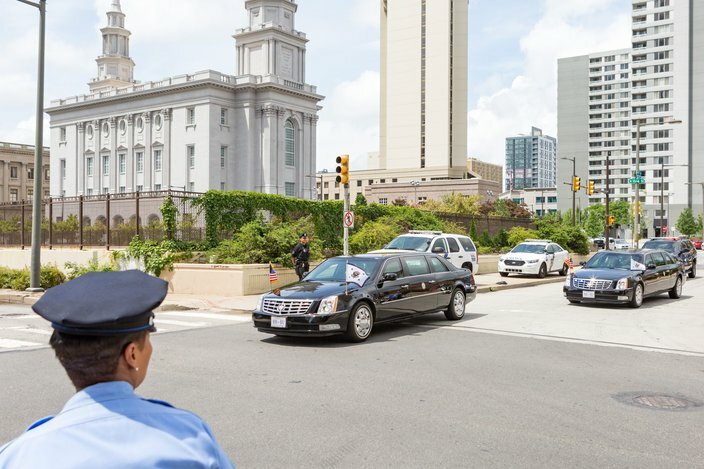 The motorcade carrying Vice President Mike Pence crosses Vine Street en route to the Sheraton Hotel where he spoke early Monday afternoon, July 23, 2018.